This couple is from the Boston area but decided to have a Florida destination wedding in Southwest Florida! Kellie and Ryan were married shortly before this was taken on the beach right in front of the Marco Island Marriott Hotel in Marco Island, Florida. Shortly after their beach wedding ceremony a storm broke out, and we had to run inside the Marco Marriott Resort for cover. This picture was taken in early September. Summer storms in Florida often make for incredible sunset wedding photography, and we were able to catch a glimpse of the tail end of Florida's sunset season! The bride and groom brought along their own umbrella for a prop. We had the idea of creating a silhouette of their heads behind the umbrella. We did this by placing a light behind Kellie and Ryan while exposing for the sunset, and setting the flash at a low enough power in an effort to not spill light in the wrong places. This was done in an effort to preserve the "Just Married" writing on their umbrella. 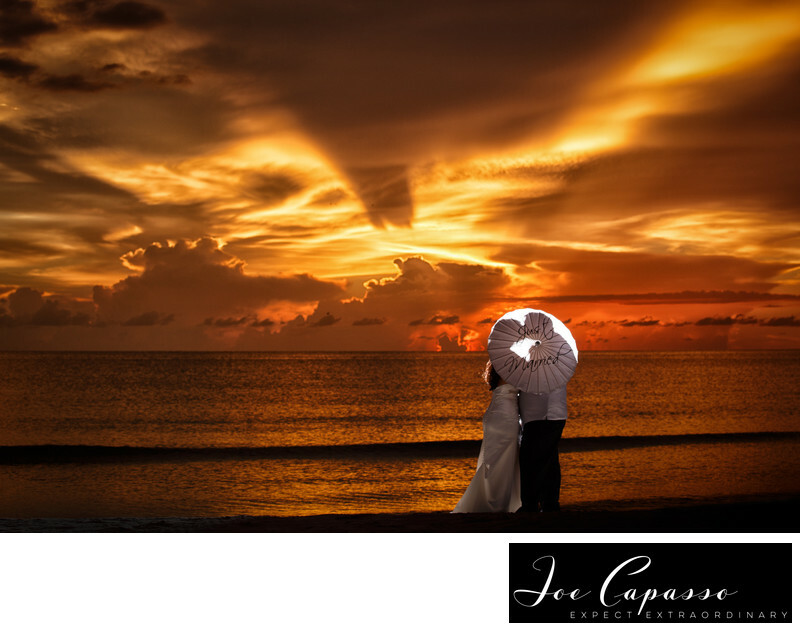 This is just one of the amazing wedding photography moments we captured during the couple's Sunset Wedding on Marco Island. Be sure to check out our blog to see more images from this Marco Island Wedding! The Marco Island Marriott is a popular venue for a Florida destination wedding. Other nearby popular wedding venues include the Marco Beach Ocean resort, and Laplaya beach and golf resort in nearby Naples, Florida. Jim Dalia from a DJ with class provided music for the even. Kevin Morris from Botanicals on the Gulf designed Kellie's flowers. Keywords: florida wedding photographer (12), marco island marriott (12), marco island wedding photographer (12), naples wedding photographer (45). 1/125; f/5.0; ISO 100; 70.0 mm.